When you think of addiction, various illegal and harmful substances probably spring to mind…but not sugar. Yes, you know that candy, cookies, soda, and your other favorite sweet treats aren’t the healthiest options—and sure, you may feel the urge to satisfy a craving once in awhile—but there’s no way that sugar can totally hijack your life…right? Wrong. Believe it or not, sugar is highly addictive and acts on the pleasure center of the brain just like alcohol and heroin. In other words, the more you eat, the more you want. Combine sugar’s addictive nature with its omnipresence in our sweets-and-carbs-loving society and you have a recipe for a health disaster. Fortunately, the popular For Dummies® series is here to decrease your reliance on sugar and make positive changes that will help you transition to a healthier diet. In his book, DeFigio explains the science behind sugar addiction and why it’s so harmful for your body. He also helps readers identify whether they might be sugar addicts and gives them the tools to create a sustainable and more nutritious diet, including exercise recommendations and healthy recipes. One of the first steps in decreasing your reliance on sugar, he says, is making smarter choices regarding the food you buy and eat. Diet soda. Diet sodas are sugar-free and calorie-free, so they must be a healthier alternative to sugared, “original” soft drinks, right? Wrong. Diet drinks are artificially sweetened with aspartame (NutraSweet), a chemical that causes brain damage and increases appetite. The type of caramel coloring used in many diet sodas is a carcinogen, and the phosphoric acid in sodas leeches calcium out of your bones, contributing to osteoporosis. Yikes! Frozen entrées. Because today’s brands of health-conscious entrées are low in fat and calories, many dieters believe that they’re making a smart decision by eating these handy products. A quick look at the ingredients list shows that this isn’t the case. For example, a glazed chicken entrée from the most popular line of “healthy” frozen foods contains high-fructose corn syrup, several preservatives, salt, artificial caramel color, partially hydrogenated oil (trans fats), sugar, and maltodextrin (more sugar). None of those things are going to win a healthy ingredient contest anytime soon! Bacon. Sorry, bacon lovers. Though a high-protein breakfast is desirable, you can find much healthier protein sources than bacon. Conventional bacon is made from feedlot hogs and is usually loaded with nitrites and other preservatives, sugars, artificial smoke flavoring, chemical coloring, and MSG. Ounce for ounce, bacon is mostly fat and chemicals. Did your appetite survive that description? “If you really love bacon, find a local farmer who can sell you bacon that’s made without harmful chemicals from animals that are raised on good food without hormones,” suggests DeFigio. Canned soups. A piping hot bowl of chicken soup or chili sounds like a healthy meal. Even though meat and vegetables are the primary ingredients, canned soup typically contains feedlot meat, too much salt, genetically modified ingredients, high-fructose corn syrup, MSG, and preservatives. “If you don’t want to make your own soup, look for brands that are made from organic ingredients, without chemical additives, and that are canned in BPA-free containers,” instructs DeFigio. Genetically modified foods. In the 1990s, food manufacturers began using plants that had gone through a process of genetic engineering—inserting genes from other plants, animals, or bacteria to alter the crop’s genome. Foods that have been genetically modified—often referred to as GM foods or GMOs(genetically modified organisms)—have caused concern among some members of the scientific community for possible human and environmental health risks, such as infertility, organ damage, and immune system problems. Microwave popcorn. You may consider popcorn to be a low-calorie, high-fiber snack, but microwave popcorn isn’t a healthy choice. When microwaved, popcorn bags leak perfluorooctanoic acid (PFOA) and other plastic residues into your food. PFOA has been linked to infertility, thyroid disease, and a host of other endocrine disorders. Fruit juice and juice drinks. Even though fruit juice is loaded with vitamins and antioxidants, even 100 percent juice contains too much sugar to be a good choice for those who are trying to limit their sugar intake. Excess fructose (fruit sugar) causes body fat accumulation, increased appetite, liver disease, and elevated cholesterol and triglycerides. And be careful: Juice cocktails and juice boxes for kids are often only 10 percent fruit juice, with the rest of the ingredients being high-fructose corn syrup and other sweeteners, artificial colors, and preservatives. Rice cakes. Any all-carbohydrate snack—especially if it’s made of processed, enriched grains—causes an insulin spike followed by a blood sugar crash several hours later. Rice cakes, granola bars, and other all-carb snacks aren’t good choices for sugar addicts, because the lack of protein keeps them on the blood sugar roller coaster and stimulates cravings. “Half a rice cake (whole grain, not enriched) topped with almond butter or organic cheese adds fat and protein to mitigate the insulin response and keep your blood sugar levels more stable,” comments DeFigio. Protein bars. Most of the protein bars found on the shelves of grocery stores and health food stores are laden with sugars, syrups, preservatives, andfractional oils (oils that are processed to become more saturated than they are naturally). Peanut butter. Though natural peanut butter is a good source of healthy fats and protein, industrial peanut butter (including commercial brands like Skippy and Jif) is made with hydrogenated oils (trans fats) to keep the oil from separating to the top of the jar. Industrial brands also add sugar and sometimes other additives like preservatives and flavorings. Dan DeFigio is the author of Beating Sugar Addiction For Dummies®. He is one of the most respected names in the fitness and nutrition industry. His articles have appeared in numerous professional journals, and his workshops have been presented in many cities across the United States. He has appeared on the Dr. Phil show and was featured in SELF Magazine, MD News,Personal Fitness Professional, and a host of other publications. 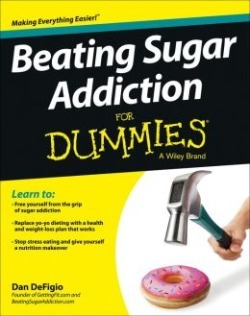 Beating Sugar Addiction For Dummies® (Wiley, June 2013, ISBN: 978-1-118-54645-1, $19.99) is available at bookstores nationwide, major online booksellers, or directly from the publisher by calling (877) 762-2974. For more information, please visit the book’s page at www.wiley.com.